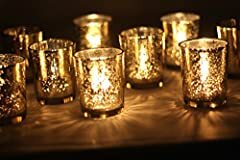 "Wedding Decoration Votive Candle Holder in Gold - SOLD BY DOZEN - 2.25" X 2.5"
SET OF 6 BEST-SELLING DESIGNS: Includes our popular Liquid Motif, Circle Motif, Globe Design, Vertical Motif, Diamond Motif, and Column Motif candle holders. 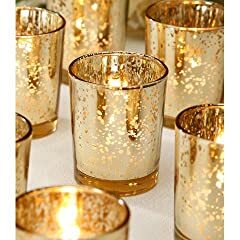 STUNNING GOLD MERCURY GLASS: Antiqued metallic finish - the reflective and shimmery surface enhances the candle's light. DECORATE WITH EASE: Easily compliments virtually any color scheme. 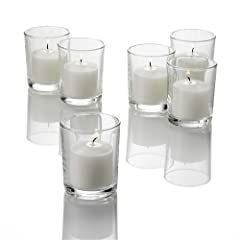 For use with tea light candles. 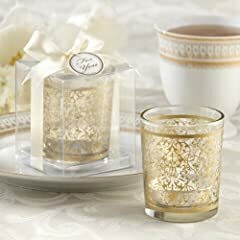 FOR WEDDINGS & CENTERPIECES: Decorate your tabletop beautifully and affordably. 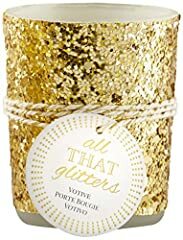 FOR DECORATING & GIFT GIVING: Perfect for homes and celebrations, and makes a wonderful, unique gift. 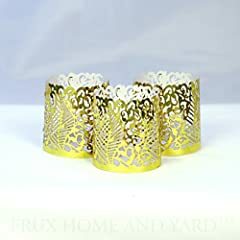 Discounts when ordering multiple products sold by Frux Home and Yard. Flameless tea lights paired with these paper wraps are perfect for creating any mood you are looking for. 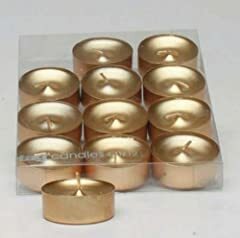 Elegant paper Tea Light Wraps to add a touch of sophistication to your flameless LED tea lights. 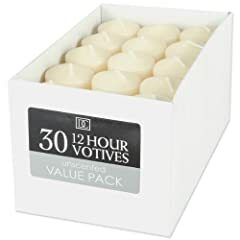 Each package comes with 48 paper votive wraps, specially designed for flameless LED tea lights. "List Price: $ 29.99"price="Current Price: $ 14.97"
"List Price: $ 29.99" price="Current Price: $ 19.99"
"List Price: $ 14.99" price="Current Price: $ 14.52"
"List Price: $ 24.99" price="Current Price: $ 18.99"